There has been another museum theft in Greece. At 7.30 local time this morning two masked men overpowered a security guard and stole between 60-70 objects. The Museum guard was tied and gagged. The BBC reports that "the robbers - one of whom had a gun - targeted the guard during a shift change, after having already knocked out the alarm." Most of the stolen items were small bronze, gold, and clay statuettes, which will be very easy to hide, and unfortunately easy to sell. The thieves were dressed in military fatigues, and were well-armed. Police have described it as a "well-calculated" hit. But other reports indicate the thieves spoke only broken Greek, and that they weren't familiar with the museum, asking where objects like a gold wreath were, even though the museum had none of those objects. This theft comes after the theft from the National Gallery in Athens, and amid protests and fires which have destroyed some buildings. It also has caused the Greek Culture Minister Pavlos Geroulanos to resign. Connections will be drawn to Greek austerity, but whether it was funding cutbacks which have made this theft possible has not been established. There was a breakdown of security here, and it may be that thieves saw the thefts in Athens and were brazened. A culture ministry official told the AP that the thieves "seem to have operated more as if they were carrying out a holdup". Yiannis Mavrikopoulos, head of the culture ministry museum and site guards' union put the cutbacks squarely at the feet of the bodies urging Greek cutbacks: "The cutbacks imposed by the European Union and the International Monetary Fund have hurt our cultural heritage, which is also the world's heritage . . . There are no funds for new guard hirings, . . . There are 2,000 of us, and there should be 4,000, while many have been forced to take early retirement ahead of the new program of layoffs. We face terrible staff shortages. As a result, our monuments and sites don't have optimum protection - even though guards are doing their very best to protect our heritage. " 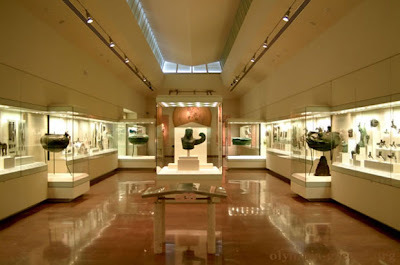 Robbery at Ancient Olympia museum, BBC, February 17, 2012, http://www.bbc.co.uk/news/world-europe-17071934 (last visited Feb 17, 2012). Nicholas Paphitis, Museum robbed at Greece’s Ancient Olympia, Google News, February 17, 2012, http://www.google.com/hostednews/ap/article/ALeqM5hueW4Ohi6iY0JYUbVnIZslcSHwoA?docId=f762a40068e9489dacd391175db3023e (last visited Feb 17, 2012). The money to protect the antiquities is in the antiquities if Greece is willing to share ownership. Let collectors and investors buy the capital appreciation that antiquities and artworks generate so that Greek cultural authorities can generate capital income with the financial value of their cultural property. Perhaps, but I'm not sure many Greeks would agree. They'd argue its the financial value of these objects which motivated this armed theft. The Museum of the History of the Olympic Games was robbed, not the main archaeological museum. It was smaller and less protected, but would generally not warrant a higher level of protection. Saying this, I do believe the Cultural Ministry should do something about alarms and security measures in the country. However, we also need to situate this within the context of museums being robbed and works stolen worldwide. It happens and the connection to the crisis needs to be tempered by this. The real reason these recent incidences in Greece are particularly interesting is because it marks a change in the social atmosphere of Greece. In the past, armed robbery was non-existent, but the violence is spreading due to the current political and economic climate. This is what is truly worrisome.